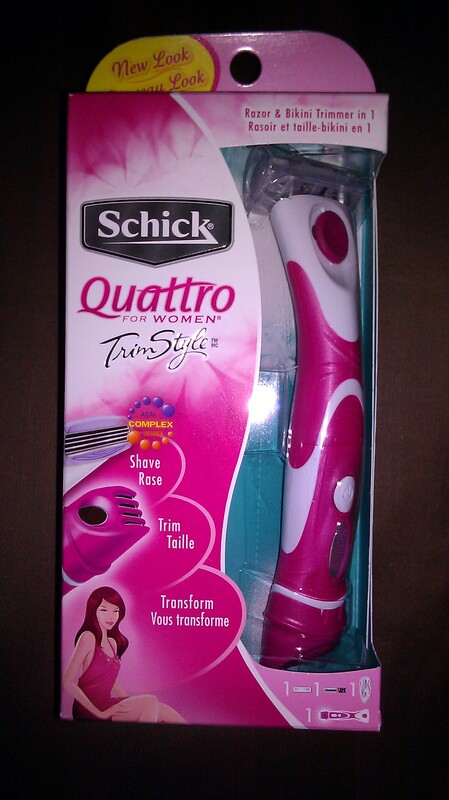 I’ve been wanting an electric trimmer for touch-ups on the go and decided to give the Schick Quattro a try. This convenient and compact razor/trimmer has a traditional razor blade on one end and an adjustable electric trimmer on the other. The electric trimmer is powered by 1 AAA battery (that’s included) and has an adjustable comb for 3 different lengths that can be completely removed. The trimmer is great for cleaning up the bikini line, side burns, under arms or any other small area that needs a trim. I wouldn’t recommend it for large areas like the legs. The hair does need to be grown out a bit for the trimmer to catch it. I never let my hair grow out very long so I had to remove the comb altogether to get proper results. Just remember that it’s a trimmer and won’t get you completely clean shaven although it does get pretty close. If you want to be completely “bare down there” or anywhere else, I suggest you use the other end and shave with the razor. The trimmer can be powered on and off simply by pressing the little button which I didn’t have a problem with, but I can see how it would be easy to bump it and turn the trimmer on-and-off by accident. The razor is what surprised me the most. I have been using Venus razor blades for years and didn’t think there was anything better out there, but I was so wrong. I like the Schick Quattro blade much better, It got me clean shaven and made my skin feel baby smooth on the first pass of the razor. The four-blade razor is enriched with acai berry & jojoba extracts. I also find that the Venus blades dull very quickly, I haven’t been using the Quattro long enough to judge how long their blades hold up. This razor/trimmer combo is also waterproof which is great for use in the shower. It’s not water-resistant which is important to remember. You can use it in the shower and rinse off each end but I wouldn’t recommend immersing it in water for any length of time, which may make for awkward maneuvering when taking a bath. I found this trimmer/razor easy to maneuver and the pink/white aesthetic and slim design makes it lightweight and essentially “girly”. Schick makes a version for men in black, if the girly pink is not your thing. This shaver is great for travel and won’t take up a lot of room on the ledge of the tub. It also comes with a plastic holder you can mount on the wall. I find those holders faulty and don’t want to risk it falling and and breaking the trimmer so I haven’t used it. I think retail is around $20 but you can order your own Schick Quattro for $10 on amazon.com, for the price you simply can’t lose. really interesting ! where did you get this at? It looks so durable for a razor. I got it from Amazon but they sell it at Target too. Where can I get one of these and everything I need for it? They’re sold at Amazon and Walgreens.